In case you've missed our tweeting and the Global Math presentation Tuesday, we are running a series over at Explore MTBoS for people new to the community. This week people are reading and commenting on blog posts. I can certainly use the reminder that comments are a good idea when reading. It's been great fun getting email notifications of comments on this blog. We encouraged people to sign up for notifications, so if you respond to their comment they should know. Feel free to do so! Starting on Saturday the 25th we'll be explaining about Twitter. Twitter can be overwhelming with all the shorthand we use, so we are running a few Q&A sessions. Veteran tweeps, it would be most appreciated if you were available and watching the #MTBoS hashtag to assist in orientating people. On Saturday, May 2nd we will talk about how to organize all the information people have gathered! Twitter and blogs can quickly get overwhelming and that's the point where many people quit. To prevent that, we'll talk organization strategies like blog readers. If you've read or written something about how you manage the information overload that is #MTBoS, please leave a comment here so we can include it. The final exploration on May 9th will be other resources. If you thought of something that exists in the community that we didn't highlight at the booth, please use this form to let us know. That way we'll have it for future booths and for the site. 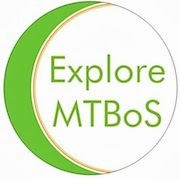 Finally, if you're interested in being a mentor to a new #MTBoS explorer, do so! Reach out if a new person follows you. Help out if someone is struggling with hashtags. Add a nice, extra welcoming sentence to your directory entry. My last 'hobby' is "helping people explore the #MTBoS (please tweet or email me with questions!)." Reminder: to edit your card, search for yourself and choose Edit in the bottom right corner. For blogs: Feedly. I feel free to skip something if it's not my cup of tea. Also, I typically only follow blogs if they're either about the topics I teach (so if I teach Calculus and Precal, very little Algebra II and no Geometry or down), if they're particularly outstanding, or if they make me laugh. For twitter: Tweetdeck helps. And continually refining who I follow. And feeling free to scroll past things. And not participating in every chat. This makes me sound very self-centered, but I figure I won't be able to help an elementary ed person as much, so finding the corner of the MTBoS that is meaningful to me helps both me and the people I interact with by making the interactions more meaningful.